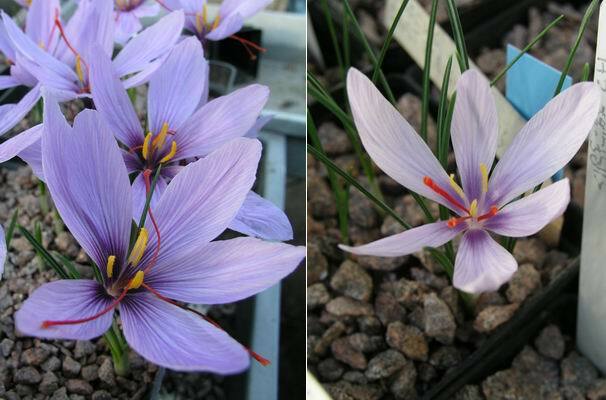 As well as looking good our Crocus sativus flowers are scenting the bulb house with the sweet smell of honey. 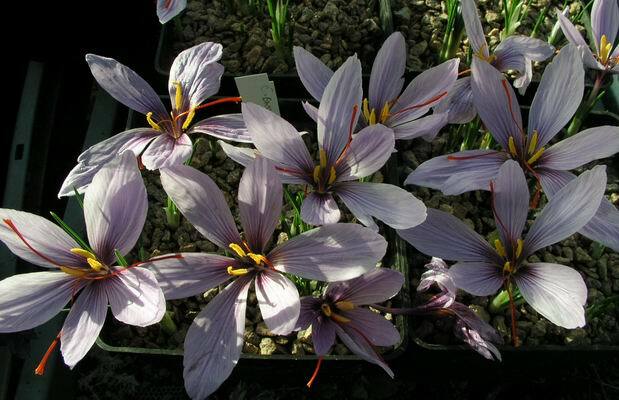 Crocus sativus surely has one of the longest recorded histories of all the cultivated plants. Mentioned by Discoridis in the first century AD in regard to its use in perfume, it has appeared repeatedly in most major herbals and botanic books since that early date. Most prized for the unusually long, bright orange style branches which when dried give us the spice, saffron. There are no records of C. sativus ever having been found growing in the wild but many believe that it is an extreme form of C. cartwrightianus which grows wild in Greece. As C. sativus is sterile and does not set seed it has been reproduced all these years by the offsets from the corm and it is a single clone. 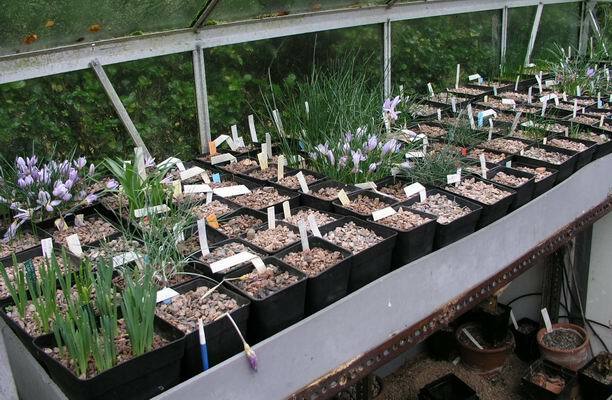 A look in the bulb house will let you see that the peak time for the autumn crocus has passed but we will have the odd pot producing flowers throughout the winter months. 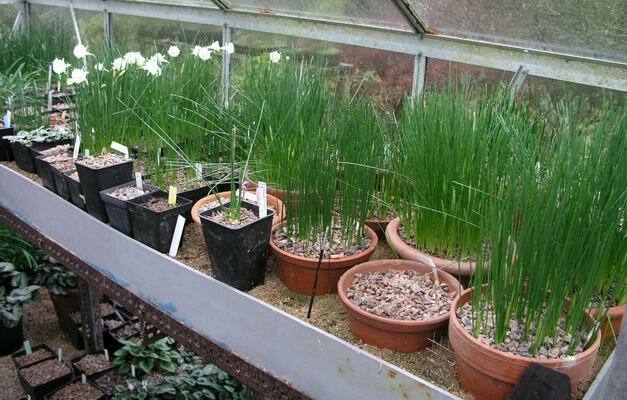 On the other side of the bulb house the Narcissus are just getting going and it is the winter flowering narcissus that will give us most flowering interest through December, January and beyond. 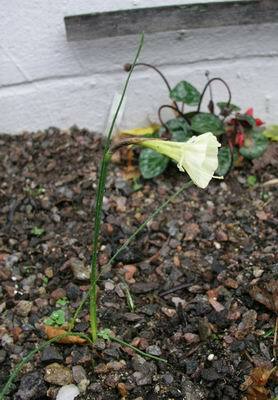 If you look carefully you will see that there are Narcissus buds popping up in many pots. 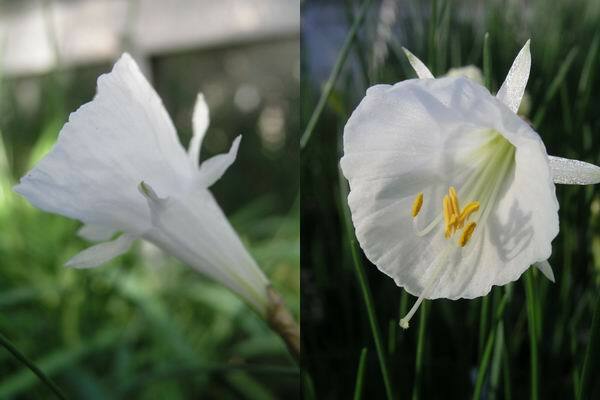 The narcissus that you can see flowering is N. romieuxii mesatlanticus, one of the most reliable flowering of all our forms of romieuxii. 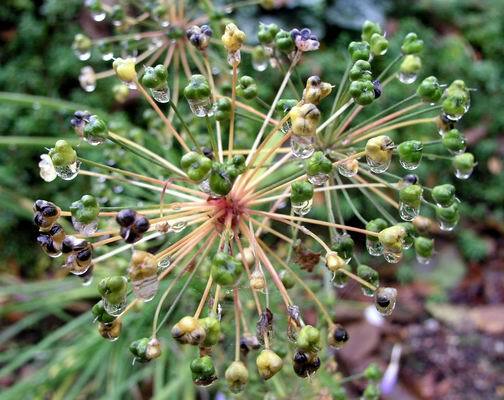 Here it is even flowering outside on a wet November day. We are still watching for and collecting seed from the garden as many bulbs set seed quite late. 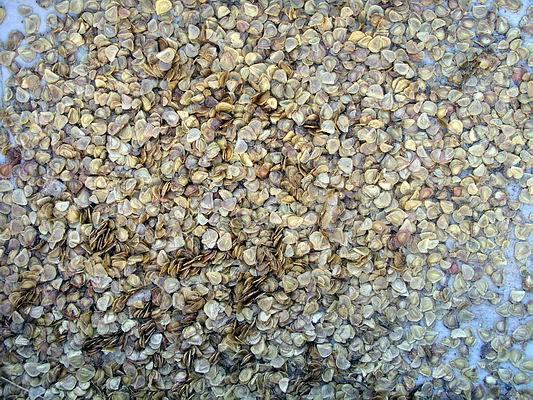 This week I harvested the seed from our Lilium mackliniae plants. Due to the heavy rain we have been having, the pods and the seeds were very wet, so I immediately removed the seeds and spread them out on a tray to dry off. After a day in our kitchen the seed had dried out sufficiently to be stored in a paper bag until I sow them at the end of January. The summer flowering lilies do not require a cold period before they germinate and if you sow them in the autumn it is very likely that they will germinate before the onset of winter. 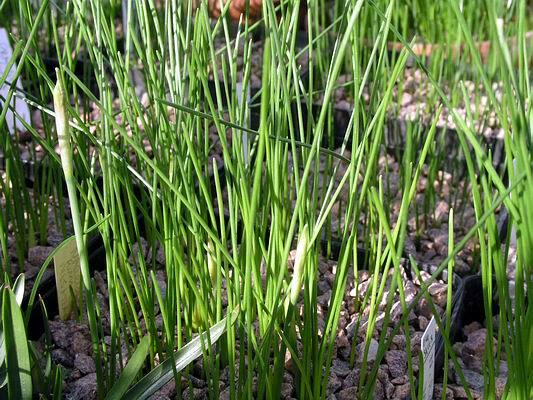 I know this through the experience of having to get young seedlings through a Scottish winter and this is not a good situation to be in; it is far better to delay sowing this seed until spring. This is also the time that I harvest the Lilium mackliniae bulbs that have been growing in a fish box trough until they reach flowering size. 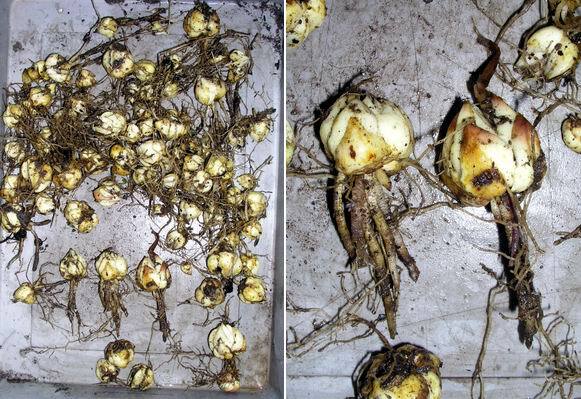 These bulbs are a good size and many have good fat storage roots still attached. These fat roots also indicate that the bulb would like to be planted deeper than a box will allow. A point worth remembering whenever you are planting bulbs in the garden is if you are not sure of how deep to plant them then it is better to plant them deeper rather than too near the surface. (Nerine, as I discussed in log 44 is one of the exceptions to this rule). 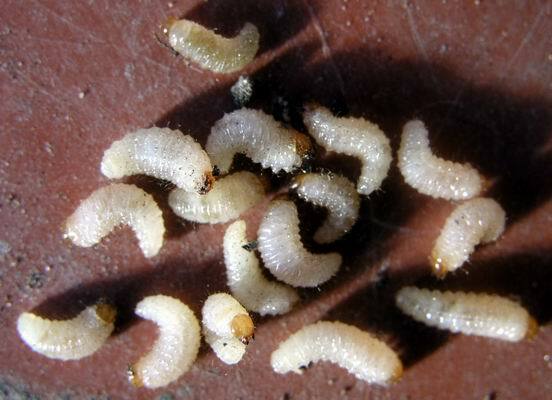 When I was lifting the Lilium mackliniae bulbs from the box I also discovered a few of these wee pests. If left to their own devices these vine weevils would have eaten away all the roots and destroyed the bulbs as well. This is another very good reason to repot your bulbs on an annual basis and catch these weevils before they do too much damage. These Colchicum autumnale corms were growing in a pot until I decided where they were to go in the garden. Having made that decision it is also a good opportunity to marvel at the under ground growth which clearly shows the roots emerging from the bottom of the new flower stem. It is at the base of this stem that a new corm will be produced before the plant goes dormant next year and as there are two multi flowered stems rising, we should get at least two corms. 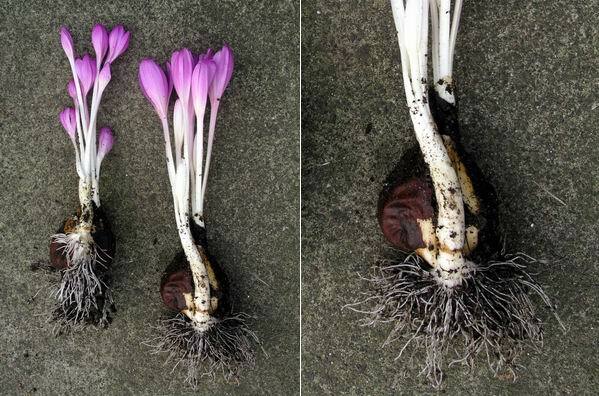 Colchicum corms are short lived and are replaced every year by new ones - aren't bulbs fascinating?